10/10/2014Share this story on Facebook! Kyle Clark said that when he arrived at IC, he headed right to the signup session at ICTV. “Diving right in, I got a true taste of TV news. For some students, it wasn’t at all how they’d imagined it. But me, I got hooked,” said Clark. After graduating from IC, he got his first job working at WHAM in Rochester, New York. 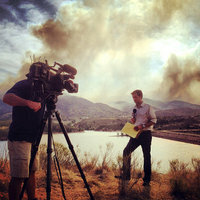 Now he is a correspondent for KUSA in Denver, Colorado. 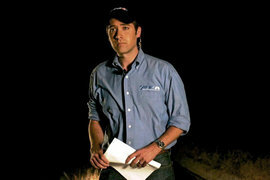 Clark said he prefers working in local news not only for the close connection he has with viewers but also for the chance to have a work/life balance. “I like to do a lot of things outside work,” he said. “A network job isn’t conducive to that.” Even at a local station, a broadcast journalist can expect to work long hours occasionally. During 12 hours of live flood coverage for KUSA, Clark remembers getting soaked while reporting in the middle of the storm and then returning to the studio desk wearing the only dry top he could find—a flannel shirt. As a result of his work ethic and determination, Clark was honored with several regional Emmys and an Edward R. Murrow Award.